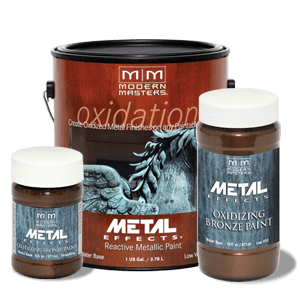 This product line has been the industry standard in Metallic Paint for more than a decade! There is a color for every project in our 47 standard colors, which include 5 unique, sheer colors. 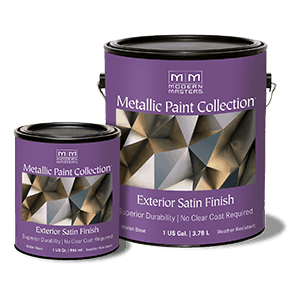 In addition we have our exclusive custom color matching service to the trade, or you can inter-mix any Metallic Paint Collection colors together, creating your own on-site custom color. 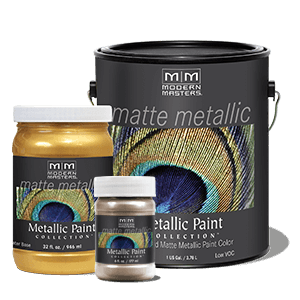 Formulated with the same shimmering particles and ease of application as our original “Satin Sheen” Metallic Paints but with a Matte finish. Besides the Matte finish, the do exhibit some unique qualities versus their counterparts, like holding the pattern created by stiff brushes or paint pads. 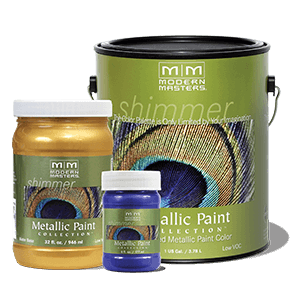 Watch our video, Modern Masters Minute on Tone-on-Tone Metallic Paint finishes for more ideas. 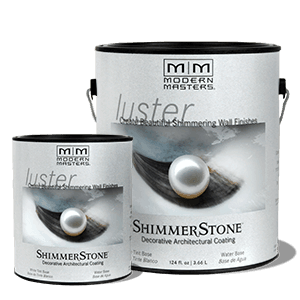 ShimmerStone® is durable, water resistant, mold & mildew resistant and will adhere to any primed surface. 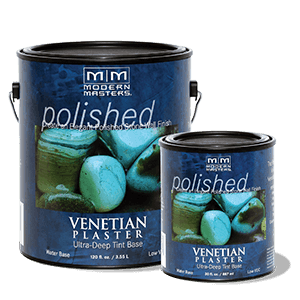 The lightweight coating applies easily and can be used to create a wide variety of decorative finishes. It does not lift when used with Modellos™, stencils with adhesive sprays or painter’s tape, making it perfect for multilayer finishes. 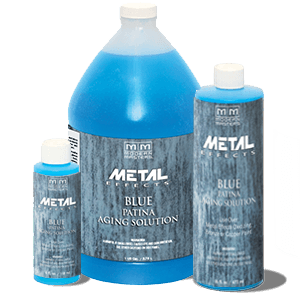 The Tint Base can be used untinted or custom tinted using small amounts of water base colorants. This tintable acrylic plaster can develop a beautiful, highly polished marble-like appearance. The more you polish, the more translucent the finish becomes. This translucency creates the depth seen in real marble, and the beautiful finish is so smooth, it even feels like marble. 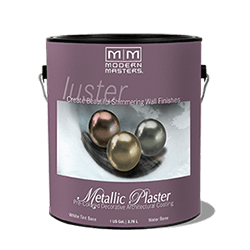 Although it was originally intended for creating dark and ultra-deep colors, finishers prefer this base for light and mid-tone colors because of its translucency and ease of polishing. 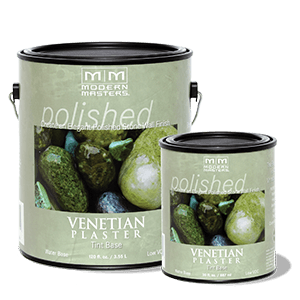 This tintable acrylic plaster base contains titanium dioxide which allows for it to be used as a white or to create light pastel colors. Various looks can be created such as lightly polished marble, stone or suede. 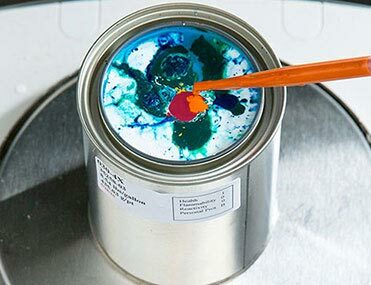 These paints only show their color under UV blacklight. Under visible light these paints appear white, then when UV blacklight is applied they change to a brilliant color. 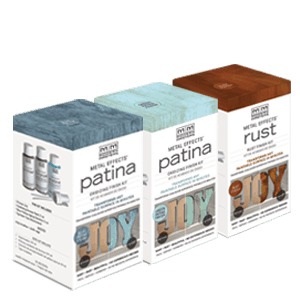 These paints cannot be mixed effectively to create custom colors, but subtle shade differences can be achieved. Under visible light each color is distinct and bright, and while under UV blacklight the colors glow brilliantly, without changing color. 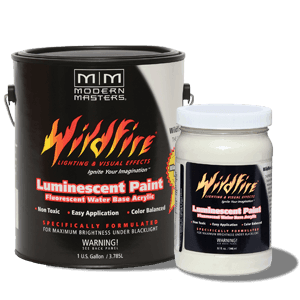 This palette includes Wildfire’s Optical White, the industries only true “white” under both visible light and UV blacklight. Wildfire paints are water base and made with 100% acrylic binders. They are inter-mixable for a wide variety of fluorescent colors including earth tones and skin tones. 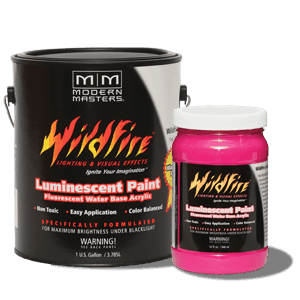 Wildfire paints are easily mixed with non-fluorescent paints such as JWR Artist’s Acrylics or Theme Paint for creating custom colors and shades.